Are You Tired Of ‘Checking In’? Foursquare, Gowalla, MyTown, Loopt, Yelp… these location based, social media services have varying degrees of participation and collaboration – both with with your immediate social network and those on the perimeter that are able to see your opinion on services, restaurants, stores, etc. Location has been in the news a lot over the last week or so. 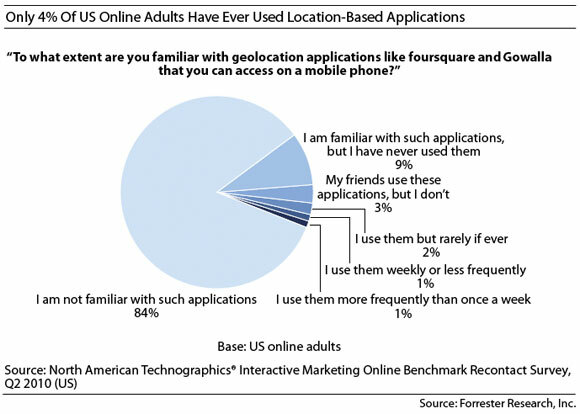 First, Forrester came out with a report that urged most marketers to ‘forgo’ Foursquare as the adoption rate and penetration was not prevalent enough to make a major impact for a brand marketer outside (their report states that only 4% of U.S. online adults have used location based mobile applications) of a small subset of early adopters. Soon after, an opposing opinion made the case for the use of such location based services – not specifically for reach and depth of penetration, but for the impact made by the influencers that are participating on a regular basis. These influencers have the ability to amplify their small sample size greatly by distributing through their larger than average social presence. For example – a Foursquare user that connects his or her ‘check-in’ with their Twitter Feed or Facebook account has the ability to distribute a potential brand message much wider than if they did not tie into those services. From my vantage point, I think you’ll see brands leverage services like Foursquare in a way that mimics what Old Spice did with YouTube and Twitter – targeting those celebrity and power users with a large social presence and tailoring specific message to them in an effort to extend the Old Spice brand through affiliation with their famous personas. Very clever, very viral, and exceedingly simple to do – the first time. The moral is that don’t build a campaign where you are forcing people to take an action that will not result in a real world, tangible value. It’s one thing to be exposed to an advertisement - it’s an action consumers are exposed to thousands of times a day. The majority of those exposures are passive. If we’re asking our loyal brand advocates to take an action, as marketers, we’d better provide them with an incentive to do so. A perceived reward for their loyalty and their advocacy of our brand to their personal network. Regardless of their location. I am a fairly active user of Foursquare, not so much Gowalla – although I do have it on my phone. We are dipping our toe in the water with location based, mobile programs here at Intel (look out for my post when that program launches) and I definitely see it as a relevant, and important marketing platform for brands now and even more so in the near future. Location based services are in the news every day now and there is case study after case study of how brands are effectively using the various services in their marketing and media campaigns. Monday, Twitter announced that they are adding ‘Twitter Places‘ to their portfolio of services to give more context to people’s tweets. This is strictly an ‘opt in‘ component to your stream – if you choose not to pinpoint your exact location. What I like most about this is that Twitter didn’t cut out other players in the location game, like Foursquare and Gowalla – rather, they’ve moved forward with seamlessly integrating those services into their launch activities and opened up their API to allow for developers to integrate this functionality into their applications. They say imitation is the most sincere form of flattery. Since SXSW 2009, where both Dennis Crowley and Josh Williams introduced their respective services, others have scrambled to catch up to the wave of momentum that has buoyed both companies leading efforts in this space. Last week Robert Scoble wrote a post on his site that discussed how Foursquare is in danger of losing ground to other companies (he used Yelp as the specific example) who are copying some of the key components of Foursquare’s offering (badging specifically). Scoble makes a great point when he states that Foursquare will need to continue to innovate, add features, and even suggests they go so far as to buy companies to add to their portfolio to stay ahead of the competition in the geolocation game. Foursquare has the advantage of being the first service to the game. They’ve also got the largest user base for this specialty (1M vs. Gowalla’s ~200k). Where the danger lies is with established properties (like Yelp) that have a loyal following, significantly larger user base, and present an attractive package for acquisition by a larger company that doesn’t currently have a geolocation component (ie Google – and no, Google Latitude or Google Places do not count). If that doesn’t make you go ‘hmmmm’, keep in mind that I haven’t even mentioned Facebook and their 400M+ user base. You can bet they’re recognizing the geolocation frenzy and soon to do something about it.